Though green shoots of recovery have started appearing in the global economy, the shipping industry is unlikely to emerge from the slump for the next two or three years, according to business executives and analysts. "The global shipping industry will come out of the winter much later than most others," said Qian Yongchang, head of the Chinese Transportation Association and former minister of communications. 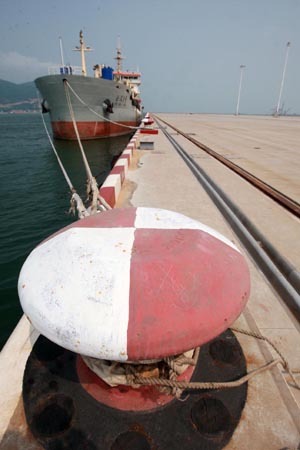 Qian made the remarks at the 2009 Global Shipping Summit held in Dalian last Friday. "There are still hundreds of ships anchored in Singapore, waiting for business," said Chris Bourne, executive director of European Liner Affairs Association, adding there is no chance of the situation improving in the short term. According to WTO data, international trade decreased year-on-year by 17 percent from January to September 2009, while imports and exports fell 20 percent in the US and Europe, 50 percent in Japan, 30 percent in South Korea, and 20 percent in China. Li Zhen, assistant to the president of Sinotrans, China's second largest shipping agency, said even if one were to ignore the slump in demand, the industry capacity far exceeds freight demand and will continue to rise in the next two years. In 2009, the peak period for delivery of new ships, capacity to the tune of nearly 10 million tons would be added to the market, while over 40 million tons of freight capacity of containers and bulk cargo will enter the market in 2010. Ship-breaking and other measures are expected to reduce only 10 million tons of capacity. Industry analysts said the number of new ship deliveries would increase considerably in next three years as result of the strong orderbook before the economic slowdown. Container freight has been hit the most with nearly 1.25 million twenty-foot equivalent unit (TEU) capacity parked at sea, and another 1.25 million TEUs will be added to the market in next 18 months. "There has been almost no ordering of new ships since September last year. There can now be no doubt that the orderbook for new ships is shrinking through cancellations and deferral, and the peak of expected deliveries in the next two years is flattening as cancellations and delays in deliveries are negotiated", Lloyd's Register Group wrote in its 2008/09 financial report released on Oct 22. The UK-based company said the future market size is uncertain in the medium term and it expects a three to five year period to elapse before significant recovery is experienced. Shipping companies, are however, trying to adopt fuel-saving initiatives, use medium-sized ships, redrafting lines, idling capacity and postponing delivery of new ships as possible steps to shore up bottom lines. But some analysts feel that the industry is headed for possible changes. Li predicted that there would be some mergers and acquisitions in the industry, while freight companies would cooperate more closely with each other to survive the tough times. Lin Futian, vice-general manager of Taiwan-based Yang Ming Group, said the company has been promoting cooperation with other shipping counterparts in logistics, and sharing terminals and containers to save costs and create other business opportunities. "We could also see an extension of the industry chain. When the economy slows down, freight firms will extend their business up and down along the supply chain, and a modern logistics service will become integral for companies," said Li. "We definitely will see a lot of changes in the industry. Crisis is always a good opportunity for improvement. Actually we are not afraid of transition. We are afraid of no change taking place during the transition," said Kang Shuchun, CEO of Shipping China Group Co Ltd, China's biggest shipping portal and the host of the summit.